Yes, we have full disabled access with a lift between floors and a disabled toilet on the lower level. Men: Please wear a shirt and smart shoes. Ladies: Please wear smart shoes or high heels. No trainers, designer trainers, sportswear or hats are permitted. We also do not allow any fancy dress or paraphernalia. Failure to adhere to our dress code could result in your entry being refused. Do you need to be a member to gain entry? No, anyone can come and enjoy the Shaka Zulu experience. How much is club entry? Our Kings Club is open every Friday and Saturday evening. Entry on the door is £10 before 10pm and £15 after. Sometimes we have special events taking place so prices may vary on these dates. We certainly do! All of our menus are available to view on the "Restaurant" and "Group Bookings" website pages. If you have any menu queries, just get in touch and our reservations team will be happy to help. Children are welcome in the venue until 9pm, after which time we are an 18+ venue. Yes, our £7.95 Young Warrior menu is a two course children's menu. We don't allow guests to bring their own wine, but with a wine list of over 100 wines we are confident you will find plenty to choose from! Camden Town station is the closest underground station, and is on the Northern Line. Take the exit on the right hand side and continue to turn right on to the main road. Continue walking for about 300 metres until you reach the overhead rail bridge, and take a left. You will see a 20ft warrior status just ahead of you marking our entrance. The Kings Club opens from 10pm. The Lounge Bar is open from 5pm so you are welcome to come and enjoy some drinks before heading to the club. Do you need to be on a guest list for the club? We would always advise being on the guest list. You can arrange this by emailing us on guest@shaka-zulu.com with your guest list. How much are your drinking tables? Our drinking tables start from £350 minimum spend and seat up to 10 guests (bottle service only). Is there parking at Shaka Zulu? We don't have our own car park unfortunately, but there is plenty of parking around. You can usually park in Hawley Road and Leybourne Road just ensure you check any pay and display restrictions. We have two private dining spaces available; one which can hold 60-80 guests, and one which can accommodate 80-120 diners. Can I hire the bar for a private function? 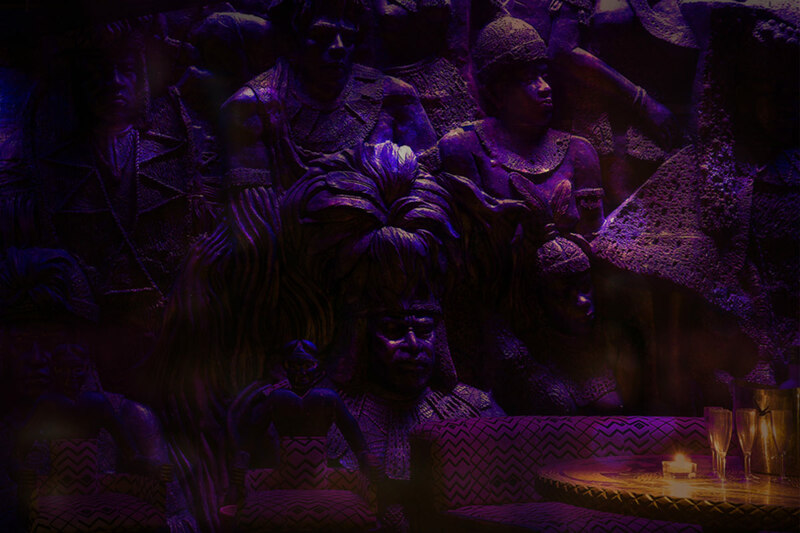 Of course, please contact our events team on events@shaka-zulu.com to discuss the available options. Our chicken is halal. If you are arranging an event or private function, we can arrange for the meat to be halal. What is the age requirement for the club and what ID can I use? Shaka Zulu is a strictly 18+ venue on Friday & Saturday nights from 9pm. Anyone under the age of 18 will be required to vacate the premises by 9pm. All guests will be asked for valid photo ID on arrival. Only a valid passport or driving licence will be acceptable forms of identification. Your ID will be scanned upon entry.